Do I smell spring in the air? Must be. And the calendar confirms that it’s just around the corner. These hints finally stir longings for that season — even for a skiier. And what better way to welcome spring in than with attention to some tropical plants. 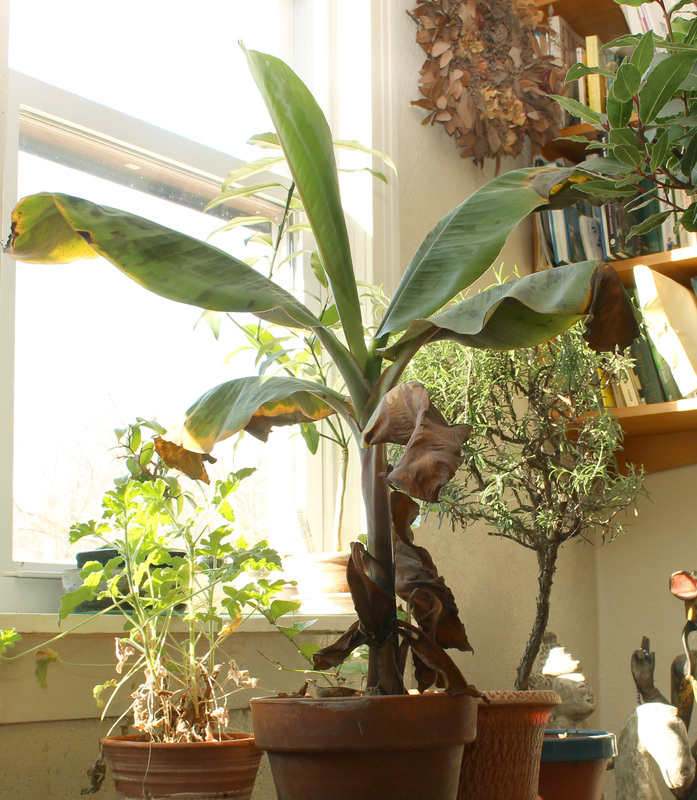 My banana plants have weathered winter very well this year, indoors, of course. Last year I was proud that my one plant survived. After all, banana is a truly tropical plant. It shivers at temperatures below 50° F. and enjoys 80° days and nights as its broad, satiny leaves drink in year ‘round bright sunlight, occasional rains, and humid air. Even if my house was warm, which it is not, only a relative paltry amount of sunlight streams through even a south-facing window, and the air is bone-dry. Hence my pride. My philosophy last year was to send my banana tree into a state of suspended animation by withholding water and keeping the plant on the cool side. It did survive winter, barely. Once the weather warmed outdoors, it took a few weeks before the plant fully awakened. Actually the mother plant never did awaken, but two of its pups did. Pups are small plants that arise at the base of the mother plant, and are one of the ways in which new banana plants are propagated. (You no doubt noticed that cultivated bananas do not have seeds). Once the pups were growing strongly, I tipped the plant out of the pot and cut off each pup to pot up separately. This fall my approach was to keep the banana plants happy. Even if they couldn’t have steamy conditions of the tropics, I would at least provide their roots with plenty of water. And happy they are: New leaves have unfurled all winter, with few of the older ones drying out. By the end of May, the weather outdoors will be ready to receive the plants, which should grow exuberantly, as bananas are wont to do with good conditions. Bananas bear quickly so at this rate I may sometime be harvesting fresh fruit. If not, I can always use the leaves to make Indonesian pepes. Notice, above, that I never referred to a banana “tree.” Banana plants might look tree-like and grow to the proportions of trees, but they are not actually trees. They are giant, perennial herbs. 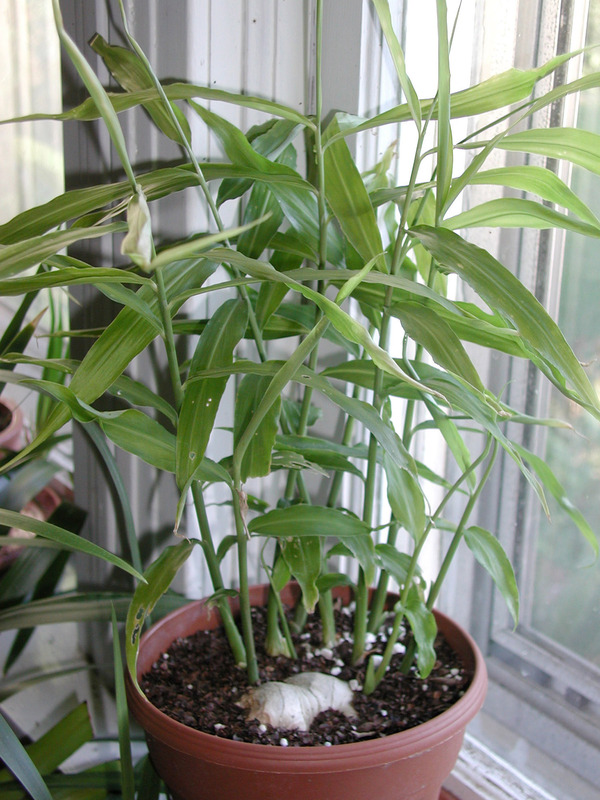 The “trunk” is composed of a sheath of tightly-wrapped leaf stalks. Each vertical stalk successively unfurls into a broad leaf which then splays its blade out horizontally. All new growth is pushed up from the corm at the base of the leaf stalks. Musa basjoo is a banana that’s cold-hardy to about zero degrees F. The top will die to the ground in winter but the corm, if mulched for further protection in the ground, survives winter. 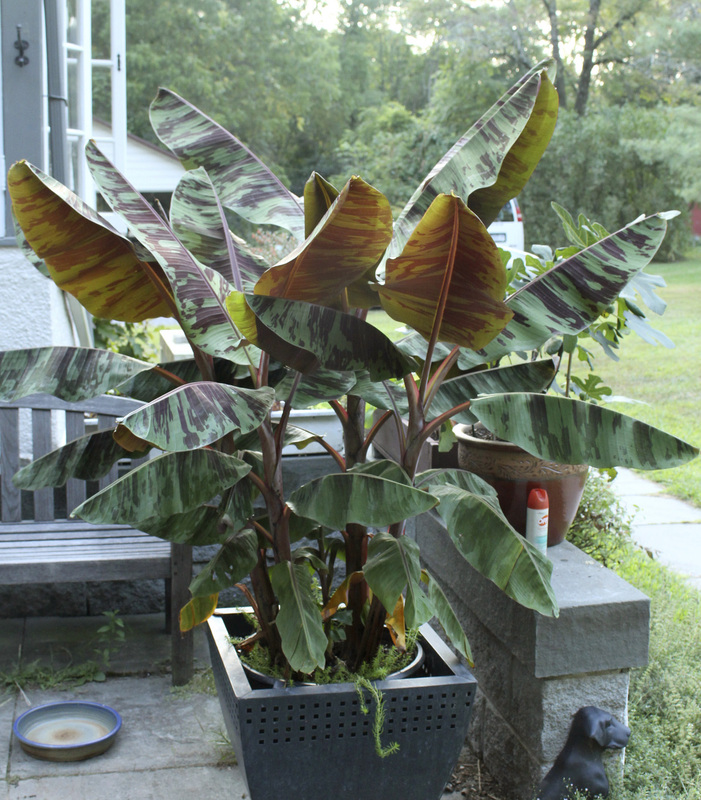 Nothing worth eating from this banana plant, although it makes a bold, tropical statement in summer. I could never understand the current commercial interest in growing ginger, a tropical plant, in cold winter regions, such as here. Until last year, that is, when I tasted freshly harvested, immature ginger I got from a gardening friend. The roots had a smooth flavor and fiber-free flesh as compared with the mature roots usually sold. So this year, of course, I’ll be growing ginger, and the time to begin is now. To that end, I “harvested” some mature rhizomes from the grocer’s shelves, broke them into pieces each with 3 to 4 eyes, and planted them. Not outdoors, but indoors. And not just any place indoors, but somewhere especially warm. 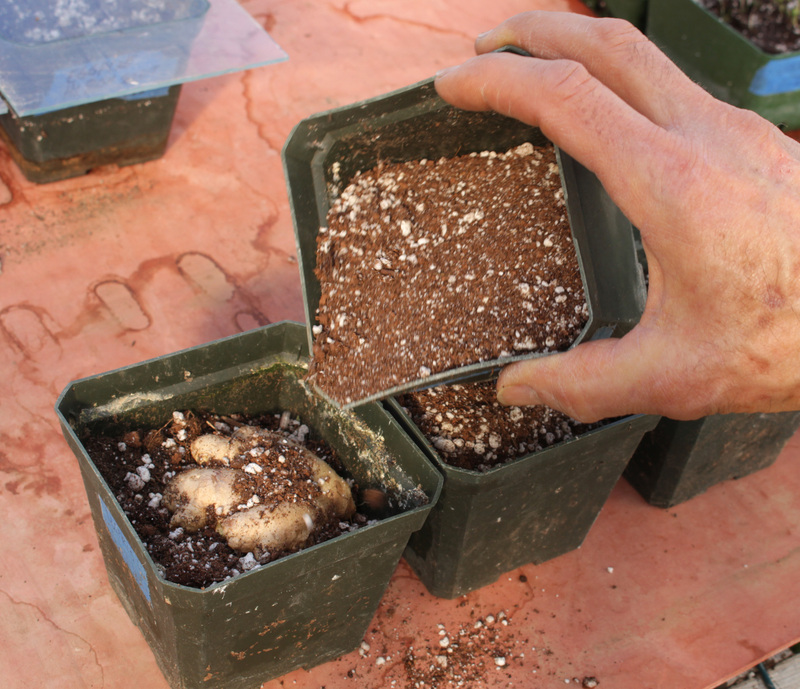 Ideally, roots and shoots will have filled those pots by the time the greenhouse has been cleared of lettuce, arugula, and other cool weather greens and the soil temperature is above 55°F. That’s when the ginger can be planted in the ground; I figure on the end of May. Ginger is a heavy feeder, so each plant will go into a mound of pure compost that I’ll add to as the plants grow. Come September, I’ll pull the roots. They won’t yet be mature. That’s a good thing. Banana and ginger both grow from underground structures, a corm and a rhizome, respectively, each providing energy storage and buds for new plants. Corms and rhizomes are modified, underground stems. A corm is an upright, fleshy, thickened stem having a protective tunic of modified leaves. Baby cormels arise near the base of the corm. The cormels sprout leaves and become pups like the two that grew at the base of my mother plant. A rhizome is a horizontal-growing, underground stem. New plants can be made by breaking off pieces of rhizome and planting them, as I did with the ginger and as is done with potatoes. Sometimes banana corms, like ginger rhizomes, are eaten. I won’t be eating my corms. Wendy, who commented on March 19 about her travails in fruit growing, is the winner, by random drawing, of my book GROW FRUIT NATURALLY. Congratulations Wendy. New Video, Seed Starting . . . Check out my video page for my timely, new video about seed starting. This entry was posted in Fruit, Gardening, Vegetables and tagged banana, ginger, Musa, Zingiber. Bookmark the permalink. Trackbacks are closed, but you can post a comment. I’ve grown ginger in pots for a few years now. I get a small increase each year before the leaves die back in winter. My daugter’s attempts, grown in large pots under light in her overheated Brooklyn apartment, are nothing short of fabulous: tall, vigorous plants with large, succulent branching rhizomes. Penn State thinks baby ginger would make profitable crop for Pennsylvania. https://www.google.com/search?q=psu+ginger&sourceid=ie7&rls=com.microsoft:en-US:IE-Address&ie=&oe=&gws_rd=ssl#rls=com.microsoft:en-US:IE-Address&q=psu.edu+growing+ginger. I’d really like to visit one of those high tunnels. Check out Jeff Heriot web site on growing gingerand making ginger syrup. Looking forward to a ginger update soon! Some recommend soaking root for 24 hours prior to planting. Thoughts on this? The ginger plants are growing well in the ground in the greenhouse. I plan to harvest soon to make sure none get too mature.